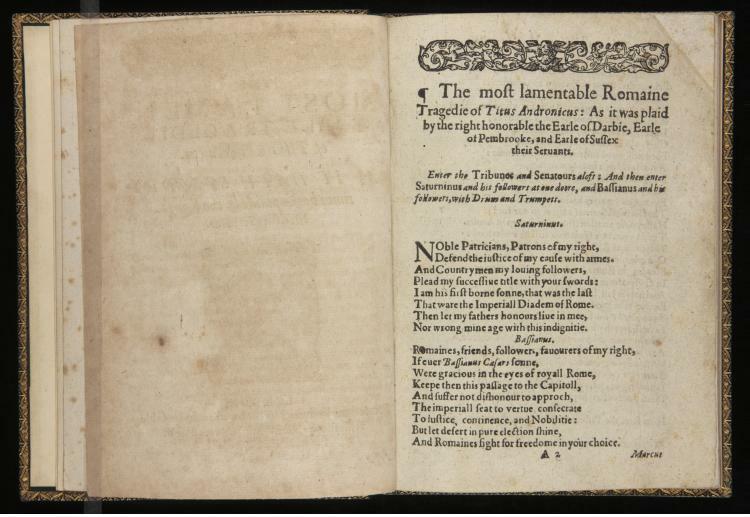 In 1611, another quarto of Shakespeare’s Titus Andronicus was printed; it was the third such quarto of the play to be printed, and it offers an attractive history-in-miniature of Shakespeare’s dramatic career. Shakespeare’s playing company, the Lord Chamberlain’s Men, enjoyed a windfall with the coronation of King James, who became the company’s official royal patron in 1603, according the company a new title—The King’s Men—whose grand status both signaled and helped to spur the company’s theatrical successes. 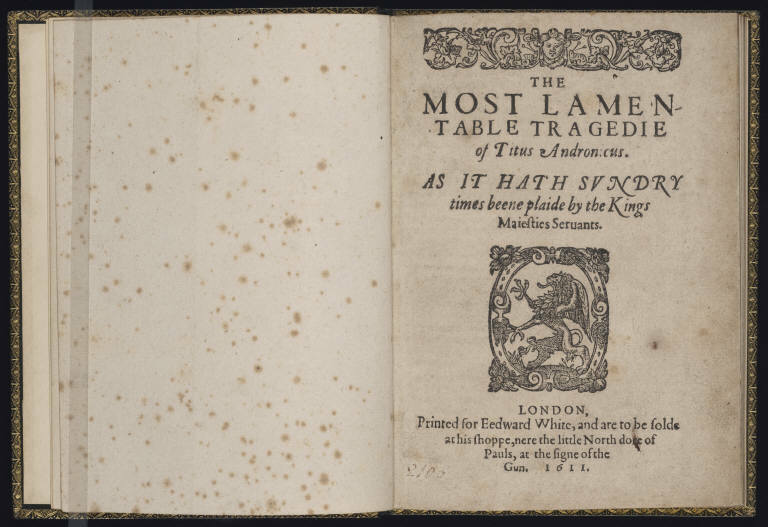 This shift in patronage and name makes its way onto the title page of this copy of Titus Andronicus, which advertises, proudly, The Most Lamentable Tragedie of Titus Andronicus As It Hath Sundry Times been plaide by the Kings Majesties Servants. Printed in 1611, this was the first edition of the play to be printed since Shakespeare’s company enjoyed the transfer of its patronage. Because of typos and variations, the 1611 quarto is generally not considered as authoritative as the 1594 first quarto or 1623 folio versions. Residues of the earlier two editions, though, cling to the third in curious ways. The first page of the 1611 quarto reads, at its top, The most lamentable Romaine Tragedie of Titus Andronicus: As it was plaid by the right honourable the Earle of Derbie, Earle of Pembrooke, and Earle of Sussex their Servants. This is the heading that caps the first page of the 1594 and 1600 quartos, and it is the same wording, too, that decorates the title page of the 1594 quarto. The royal earls mentioned here—Pembroke, Sussex, Derbie—were patrons like the Lord Chamberlaine who sponsored their own playing companies, companies that in all likelihood put on productions of Shakespeare’s play in the earlier days of his career, before he had found his place with the Chamberlaine’s Men. In other words, while Edward White, the printer of the 1611 quarto, was quick to advertise the King’s patronage on the tragedy’s title page, he was less diligent to alter subsequent pages. In all likelihood, this was because of the haste, pressure, and financial constraints that restricted White’s efforts and those of so many other printers. That negligence, though, points to a telling historical fact that abides with us today: if there was anything worth spending time on, it was the page that customers saw first. Points, too, to the many companies, patrons, and collaborators Shakespeare’s career—like any successful dramatist at this time—had to come into productive contact with. Follow this link for a scanned copy of Titus Andronicus (1611), from the collections of Yale University’s Elizabethan Club.